To all my loyal readers: I apologize because I never do this, but today I am going to post about something that is “in preservation news.” Some of you might enjoy it because you are a secret preservationist, and others might enjoy it because you are New Yorkers, and even more of you might enjoy it because you grew up in Long Island or you frequently take Amtrak to NYC. The big news is that the Federal government just put $83 million worth of stimulus money to implement phase 1 of the Moynihan Station Plan! 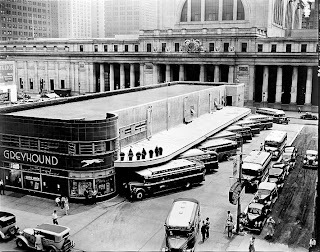 For those of you who have absolutely no idea what I’m talking about, Moynihan Station is the long discussed solution to the always depressing scenario that is NYC’s Penn Station. 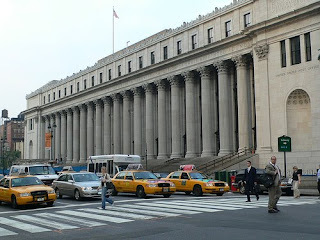 The plan for Moynihan Station entails the purchase and adaptive re-use of the Farley Post Office (pictured above), which is located across the street from the present-day Madison Square Garden, for a new Pennsylvania Station. 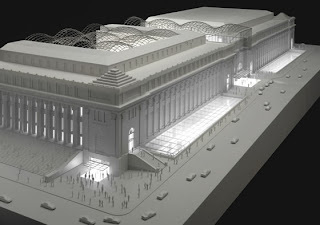 As the station through which Amtrak enters the city of New York, the present day Penn Station is completely inadequate. It operates at 100% over capacity, and is the most mixed up underground warren of rooms ever conceived. 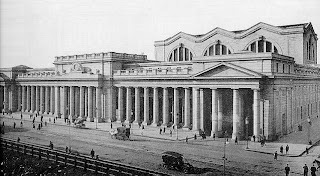 If I seem a tad overzealous about this topic, it is only because the loss of the original Penn Station was so great. 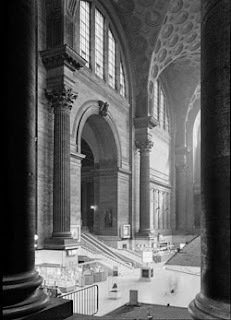 Built in 1910 by the venerable architects McKim, Mead, and White, Pennsylvania Station was designed to be the gateway to the greatest city in the world, and a temple to transportation. 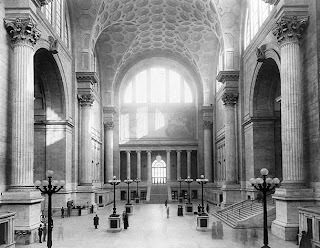 The waiting room, Pennsylvania Station. Can you imagine waiting for a train in this room? No wonder train travel was so chic. 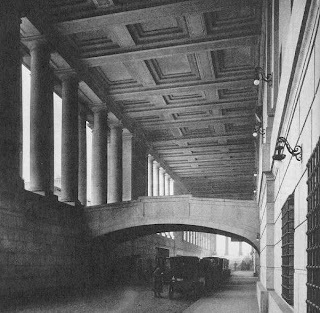 Within the station there were waiting areas for men and for ladies, as well as private clubs, restaurants, and bars. This temple to transportation recalls the Baths of Caracalla in Rome, intended by the architects, with its high, barrel-vaulted, coffered ceiling. Aahh all the endless possibilities in train travel–all the places one could see and go–before the airplane. Can you imagine getting off the train in your small town, and getting off the train here? It would only confirm that this was the place dreams were made of. Somehow even the art nouveau Greyhound bus terminal, against the backdrop of the venerable station, looks distinguished. 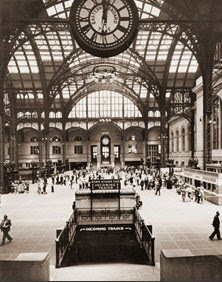 By the 1960s, train travel and the immense station had become outmoded. The space was not being used to its full capability, and the city began plans to tear down the station. Cries of outrage came from all over the city. 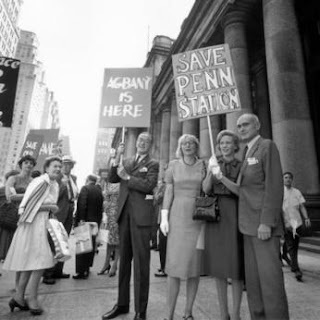 Pictured here is Jane Jacobs, the famous preservation advocate (second from left), and Phillip Johnson, the famed modernist architect (far right), protesting the demise of the forgotten landmark. Regardless of the outcry, on October 28th 1963, the unthinkable happened–they began to take the impressive structure down piece by piece. All the pink granite and travertine, sculpture and gilding, were relegated to the swamps of the meadowlands. They didn’t even have the decency to dispose of it in a gracious way. 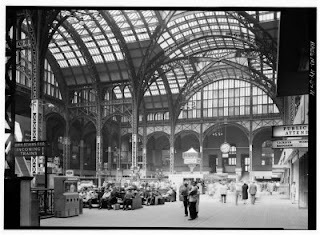 Penn Station is arguably one of the biggest losses that the preservation world has ever incurred. 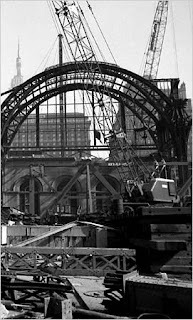 However, the loss of this magnificent landmark was the catalyst that began the preservation movement in New York, including the establishment of the Landmarks Preservation Commission. This first step towards Moynihan Station may be too little too late, but we also owe it to all those people who will be arriving in NYC for the first time, we have to remind them that they have come to the greatest city in the world. 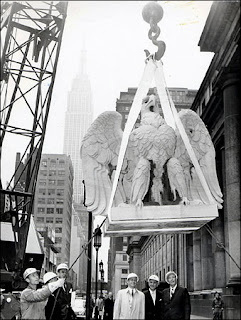 Interesting note: The eagle statue being hoisted up can now be found, along with 3 of his brothers, just outside of another magnificent train station: 30th Street in Philadelphia. There are two on either end of the Market Street Bridge. I would love to have seen it, but it was gone before I moved to NYC in the 70’s. 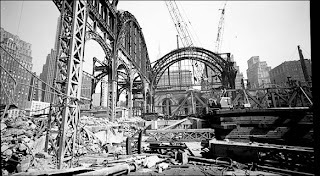 Our sensibilities towards preservation and re-use have certainly changed for the better since the station was destroyed, yet it is still a struggle. Veni vidi vici.